A Gurranabraher stonemason is seeking to restore a rare marching banner, which was used in Cork’s Monster Meetings almost 170 years ago. For the last four years, Jim Fahy has been fundraising to restore the 10ft by 10ft banner, which belonged to the Cork Operative Society of Masons and Bricklayers, and was used in Daniel O’Connell’s campaign for repeal of the Act of Union in 1843. 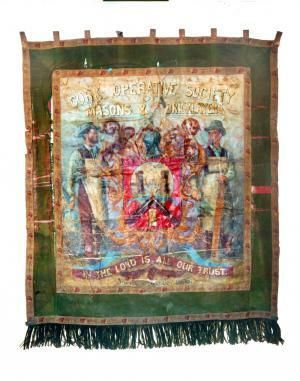 The bannerdepicts the Cork coat of arms on the front, flanked by two Victorian masons. On the back it shows the Old Parliament Building in Dublin, which is now the Bank of Ireland. Mr Fahy explained that the banner was housed in the Fitzgerald Park museum for the last 30 years, but has since deteriorated. On advice from restoration expert, Rachel Phelan, it’s estimated that it will cost €30,000 to restore the historical piece, with Mr Fahy raising €14,000 to date through the Heritage Council and fundraising events. Cork City Council have now pledged €10,000 to the project, on the condition that a further €10,000 will also be raised. Mr Fahy will be collecting at Daunt’s Square on Saturday, August 20th, marking the start of Heritage Week. Mr Fahy, whose great, great grandfather was a foreman mason on the new courthouse, highlighted that the banner is steeped in local history, with stories attached to every photograph of it. the banner was on top of the truck and when they got to Brian Boru Bridge, it was too high. They had to take the banner down and then put it back up again,” he said. Cork Masons has also made a DVD of the history of the organisation, entitled Set in Stone, and have amassed old records, since donated to the archives building in Great William O’Brien Street. Bearlager na Saor, which is now almost extinct,” said Mr Fahy. Mr Fahy added that once the restoration was complete, it is hoped the banner would be displayed in City Hall.